Ireland skipper Best has backed talisman fly-half Sexton to keep scaling new heights, in spite of becoming the first northern hemisphere player to win the game’s top individual accolade in 10 years. 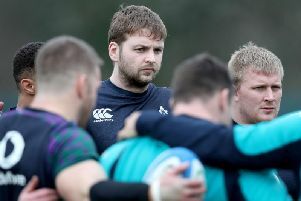 Sexton’s tenacious on-field persona is often characterised as critical to his success as Ireland’s stellar playmaker, but Best revealed the Leinster outside-half is just as central to team bonding as he is driving standards of play. “Johnny is fully aware that World Player of the Year, winning big matches, it all comes about because of his rugby ability,” Best said . “Johnny gets that. And that’s all Johnny really wants to be; the best player he can be. He wants to be the best player in the world. Ireland will launch their Six Nations defence by hosting England on February 2, kick-starting a year ending with the small matter of the World Cup in Japan. Sexton even clashed with Ireland team-mate Joey Carbery when Leinster lost out 26-17 in a feisty encounter at Munster on December 30. But Best revealed Ireland are proud to benefit from - and happy to joke about - Sexton’s single-mindedness.